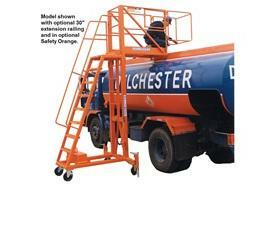 Provides easy access to tank truck and railroad car hatches. Excellent where cantilevered work deck is required. Great for trailer top snow and ice removal. Deck height is hydraulically adjustable from 9' to 13' under-clearance. Platform measures 24" x 48". Base is 28" x 60". Fixed outrigger spread is 69". Rolls on 8" casters with polyurethane tread -- 2 swivels with locks, 2 rigid. Ships in 3 pieces. Gray enamel paint.